“Before I shaped you in the womb, I knew all about you. Before you saw the light of day, I had holy plans for you: A prophet to the nations that’s what I had in mind for you,“~Jeremiah 1:5. Those are beautiful words spoken by God about the prophet Jeremiah. God affirms it is He who shaped Jeremiah in the womb. He is also the One who had a plan for Jeremiah’s life before he was born. You and I are no different from Jeremiah. 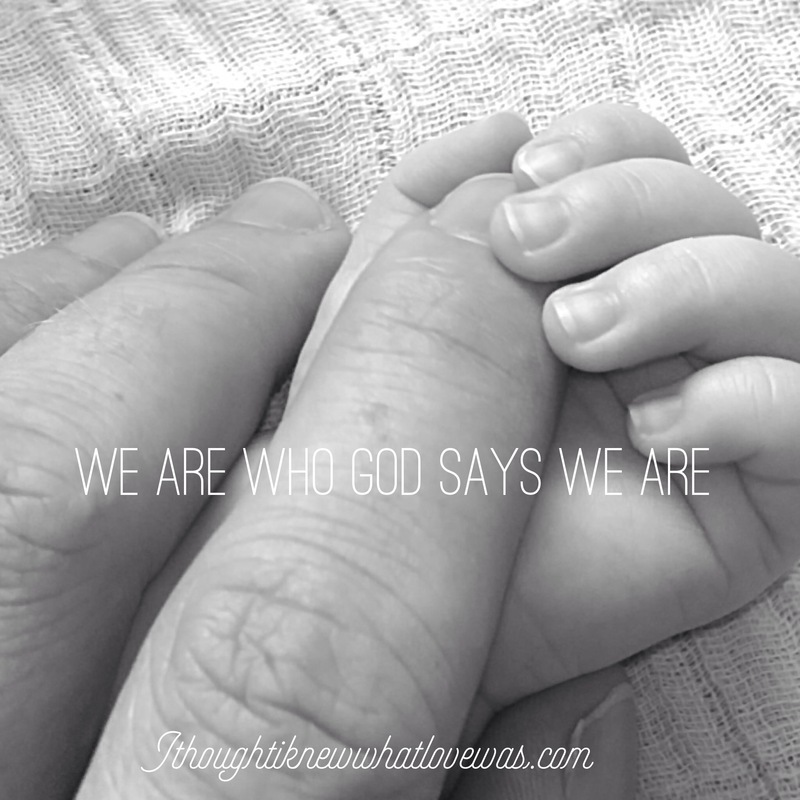 God knew us before we were ever conceived and has a great plan for our lives. We matter to God. Every life has a purpose. You were not a mistake. If you were born male, God intended you to be male. If you were born female, God intended you to be that way. Your skin color, nationality, ethnic origin, place in history were all seen and known by God. He doesn’t make mistakes. Humans make poor choices or mistakes. Because of Adam and Eve we are born with a sin nature, yet God even took care of the sin issue through His Son. We may be born with issues, that doesn’t mean God intended for us to keep them. Nor does He wish for us to sin or have a perpetual identity crisis. He longs to restore humanity to the first estate. The first estate of Adam and Eve was God’s plan. Man and woman made in His image, without sin, linked together in the first human covenant, to be representatives of Him in the earth. He made mankind in His image (Genesis 1:27). They (man and woman) together represent what He is like. They were given a purpose; be with God, love God, love one another, have dominion on the earth, rule, subdue, be fruitful and multiply (procreate). “Oh yes, you shaped me first inside, then out; you formed me in my mother’s womb. I thank you, High God—you’re breathtaking! Body and soul, I am marvelously made! I worship in adoration—what a creation! Like an open book, you watched me grow from conception to birth; all the stages of my life were spread out before you. The days of my life all prepared before I’d even lived one day,“~Psalm 139:13-16 (The Message). Our society has redefined identity. Even in the church. Everyone gets to be who they want to be. Our culture says if you feel like a duck, then you can become a duck and everyone around you must approve and applaud. If you dress like a duck, I’d still love you. God still loves you. That doesn’t mean you are a duck. Your DNA will still say human. No matter the pills we take, clothes we wear, or what we place on our drivers license/birth certificate, or what we call ourselves, our identity was selected by God and written on our DNA. On the contrary, who are you, O man, who answers back to God? The thing molded will not say to the molder, “Why did you make me like this,” will it?~Romans 9:20. You may be saying you’ve never argued with God about your identity. Have you ever wished you were someone else? Wanted their gifts, talents, skills? Wished you could look like someone else or have what they have? Tried to change who you are to fit in, so people like and approve of you? Defined yourself by success, family, marriage, or associations instead of as a beloved child of God? Defined yourself by your sin instead of what God says? Allowed others to tell you who you are? Felt discontent because you couldn’t compete with others? Allowed the opinions of others or lack of approval/acknowledgement to steal your joy? Our media is set up to bring confusion and discontentment. There’s no message that I can find of, “Be content with who you are and what you have.” Nor are there many messages stating God is the standard, the tuning fork we are to adjust our lives and thoughts to. My personality is rare, the rarest among women according to Myers Briggs. People have told me, “You’re like a man.” I’m not a man. I’m 100% female and don’t wish to be a man. Yet it’s challenging when people try to define who you are by their standards instead of God’s. God gave me a mostly logical brain, and I am a thinker. I’m not into the same things many women are. Yet I am who God created me to be; created to display His creativity in the earth. There’s a comic artist I love online. Her comics bring such joy! One day she posted how people were taking her creations and chopping them off or changing them by only showing part of the image. She as the creator was livid that her original designs were being changed. She knew the message she wanted to send to the world. When her creation was changed, the meaning was lost and it no longer brought glory to her. She was no longer honored nor her true intentions seen. It wasn’t hers anymore. It was altered, changed, and the message confused. God handcrafted you! You were and are His design. I posted somewhere I had a vision a year or so ago with all these priceless hand cut gems from heaven. The Father was pouring them out into the world via a conveyor belt. They filled the earth perfectly. Each one different and unique, and perfectly cut so they fit together. He then lit up the world; it was the most brilliant scene. What if the diamonds decided to be rubies or the emeralds to be opals? They decide to make their own design and well, that’s where we get perversion. Which is something twisted, altered, and the wrong version. The evil one says, “Do what feels good to you. God made you different than what you appear. You can be who ever you want to be! It’s your world, your body, your ideas, your feelings, and passions that matter most.” Then he sits back and laughs at humanity like I believe he did with Adam and Eve. They forfeited God’s amazing plan for something that brought sickness, torment, disease, sin, pain, confusion, abuse, heartache…all the horrors we see in the world today go back to Adam and Eve choosing their way over God’s. The devil never told them the negative consequences of believing him over God. The devil never tells anyone that stepping outside God’s will cause eventual destruction. What’s the Good News?! The good news is God always has a redemptive plan. No matter how we feel or think about who or what we are, God can and will give us His lenses and perspective. He sent His Son Jesus to redeem humanity and reestablish broken, fractured, and lost identity. He takes what was broken in the Garden and makes it whole. Sweet friends, God knew what He was doing when He created you. He has an amazing plan for your life. You are defined by heavenly standards and God sees someone He loves. He defines you by His book, His creative idea, by Himself. You were carved out of the imagination of God. God doesn’t define anyone by sin or the world’s standards. He looks at His children and calls forth their true identities as sons and daughters of God. It’s not about what we feel or what others say. It’s about what He says. Only the Creator can tell you the purpose and identity of His creation. You are a walking poem and billboard for God’s creative genuis. Papa God, please forgive us for trying to tell You who we are, for defining ourselves by the world’s standards or by our feelings/thoughts/passions/insecurities. Please cleanse us of pride, insecurity, deception, rebellion, perversion, and unbelief. Please forgive us for redefining who we are in ways that dishonor and disrespect You. Help us to seek You for identity because the greatest title we can carry is child of God. Help us to see ourselves through Your eyes. Show us what we were born for. In Jesus mighty name amen. Posted in: From the Author, God's Heart | Tagged: Adam and Eve, Bible, gender crisis, God's Plan, Identity, identity crisis, Jeremiah 1:5, Jesus, Knowing God, Potter and clay, Psalm 139, Purpose, who am I?